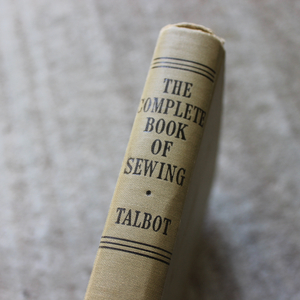 I think of underlining as the secret ingredient of sewing. 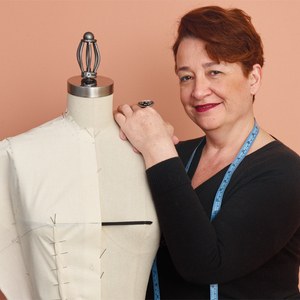 It adds body, support, and durability to a garment; makes most fabrics easier to sew; and it can often transform a fabric making it suitable for a silhouette or type of garment that otherwise would not have worked. 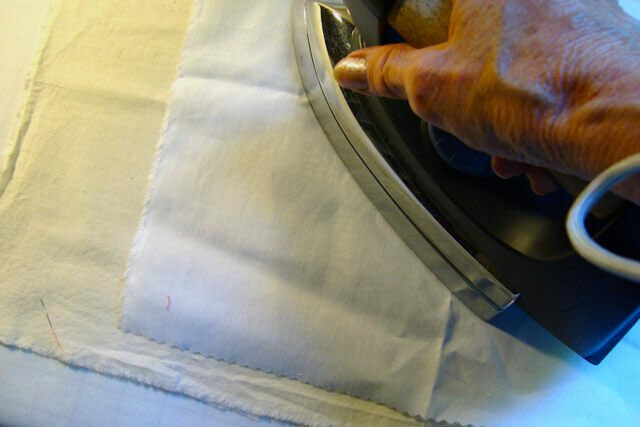 Traditionally, underlining is another layer of fabric that’s cut from the same pattern pieces, basted to the wrong side of the fashion fabric, and sewn as one layer. Underlining is not a special category of fabric. 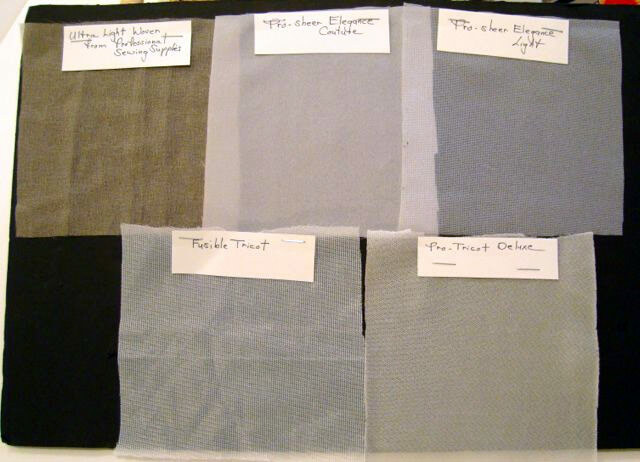 Many types of fabric (e.g. organza, batiste, flannel) can be used, depending on what is used in the garment and the desired results. I have found that, often, the best results are achieved using fusible interfacing. There are things to consider, however, before you choose one. Let me give you a few tips I’ve learned by trial and error and introduce you to some products you might want to try. I only consider woven and knitted as suitable. 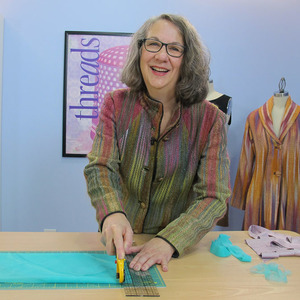 For this post, I sampled five different products—two are knitted and three are woven. I’ve provided a list below. All are light, smooth, easy to apply, require no preshrinking, and are available in white, black, and natural. I don’t think you can go wrong using any of these. 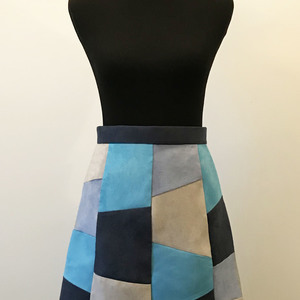 But, there are many more products on the market, as well, and it’s always important to make a test sample, similar to what I’ve done, using your fabric and the fusible you’re considering. 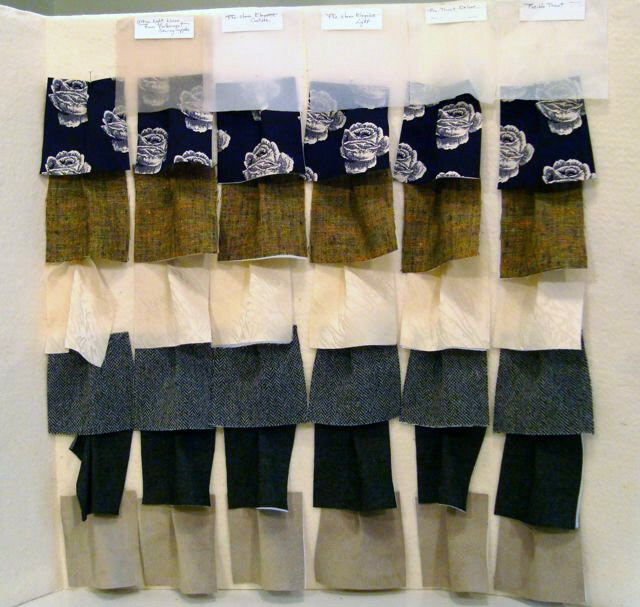 I like to keep a library of samples, on a variety of fabrics, so I can check them to narrow my choices before I start a project. My photos, of course, don’t allow you to feel the changes in the hand of the fabrics and interfacings I’ve used, but I’ve tried to at least show how underlining affects the shape. All the products I used are lightweight and fairly sheer. 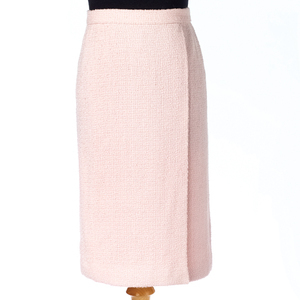 Fusible underlining gives a two-way stretch knit added body. Light, drapey silks hold their shape with added underlining. 1. Sheer woven, 36 inches wide, with a crepe-like texture and some crosswise stretch. 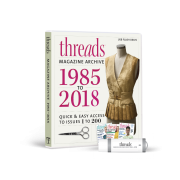 It’s available from Professional Sewing Supplies, 2623 Boylston E, Seattle, WA 98102 (206-324-8823). They don’t have a website, unfortunately. 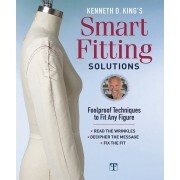 This is a great product that adds subtle shaping and stability to almost any fabric. 2. Pro-sheer Elegance Couture, woven; Pro-sheer Elegance Light, woven; Pro-tricot Deluxe, knitted. Couture is the lightest; Elegance light has some crosswise stretch; and the Pro-tricot stretches in all directions. 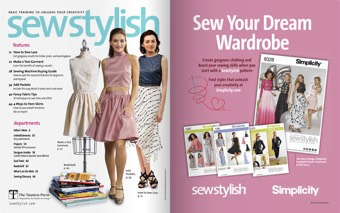 All three are 60 inches wide and available from Fashion Sewing Supply in Alden, New York. 3. Fusible tricot (Pellon Easy Knit, HTCW FusiKnit) is slightly heavier than the others, 20 inches wide, and has good crosswise stretch with stability in the lengthwise direction. It’s the most readily available in larger fabric stores. 1. Smooth, tightly woven cotton that’s stable and perfect for a dress, skirt, or pants. It could also make a fun jacket and for that a layer of fusible interfacing would give additional body and shape. 2. Midweight linen, which is multifunctional as well, but with underlining can be tailored more successfully. 3. Silk crepe de Chine/charmeuse jacquard that’s beautiful for a soft dress or blouse. 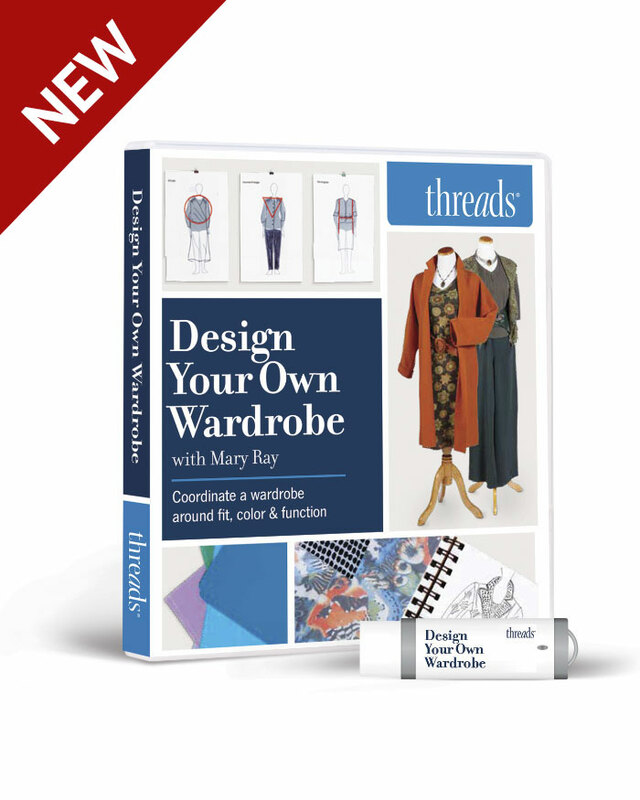 It would also make a lovely jacket, sheath dress, or dress with a strapless top and styles those would require an underlining for added body. An extra layer also helps cover the lines and ridges created by undergarments. 4. 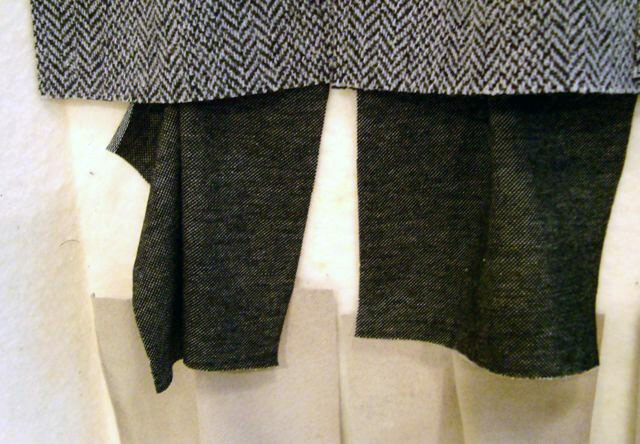 Wool flannel, a good choice for a skirt or jacket, but with added underlining can make a great coat as well. 5. Two-way stretch knit. 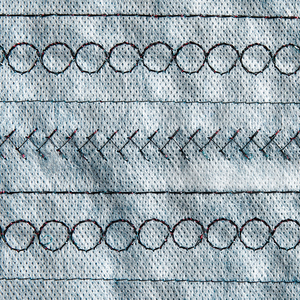 Applying underlining might take away some of it’s stretch—even if the fusible is knitted—but, that may be exactly what you want. Fusible underlining is a great way to stabilize a knit when it’s just too stretchy for the garment you want to make. 6. Real suede. I’ve learned that underlining suede and light, thin leather makes it easier to sew and helps maintain garment shape. 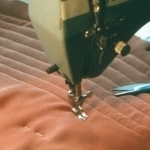 Most garments that I underline with a fusible are lined as well to hide the underlining and cover all of the seams. 1. 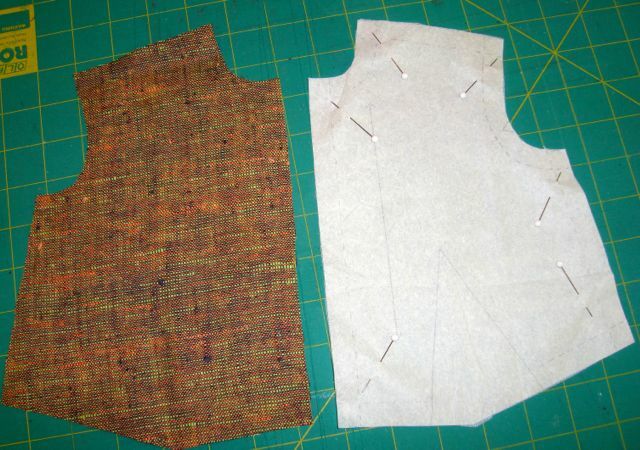 Cut out the underlining using the pattern for each garment section. 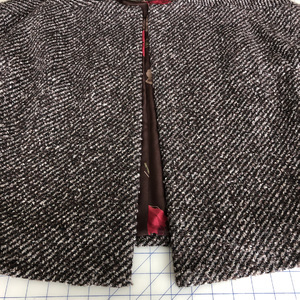 Be careful to place the pattern on grain if using a woven and directionally (stretch going across the body) if using a knit. Keep in mind that fusibles definitely have a right and wrong side and it’s often tricky to tell which is which. You can’t always see the glue side, but you can usually feel that it’s rougher than the right side. Because all of the products are so lightweight, I rarely trim away the seam allowances on the underlining. However, if you feel the seams are going to be too bulky, trim away the seam allowances before you begin fusing. 2. Carefully place the wrong (glue) side of the fusible to the wrong side of the fabric. Before you begin to press, place the tip of the iron on an edge of the fusible – if you have placed it wrong side up, you’ll only mess up a tiny spot on your iron! Most fusibles need to be applied using both heat and steam, but always refer to the product’s directions for correct temperature settings. Place the wrong (glue) side of the fusible to the wrong side of the fabric. Be sure you’ve placed the underlining correctly on the fabric. Test a corner first. 3. Before you apply the underlining, cover with a press cloth. I lay a piece of muslin on my pressing surface first, in case the fusible section extends beyond the fabric edges, it won’t stick to the ironing board. 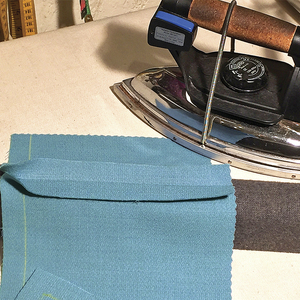 Use a press cloth when applying fusibles to avoid messing up the iron plate. Press and lift your iron. Most products require both heat and steam. 4. After I fuse to the wrong side, I flip the section over, cover with the press cloth, and press from the right side. I used a lightweight fusible interfacing, the sheer from Professional Sewing Supplies, to be a little creative and make a top with pressed in random pleats. The lightweight woven interfacing from Professional Sewing Supplies made a perfect base for the pleated front of my V-neck top. 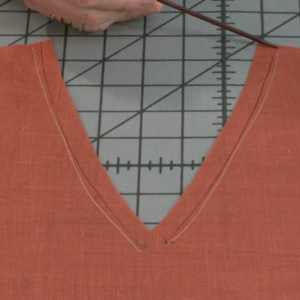 Here’s how to make the textured top that I’ve worn and washed several times—and the pleats stay firmly in place. 1. Cut out the front section of the top, according to the pattern, from fusible interfacing placed wrong side up. 2. Cut the back and sleeve sections from the silk according to the pattern. 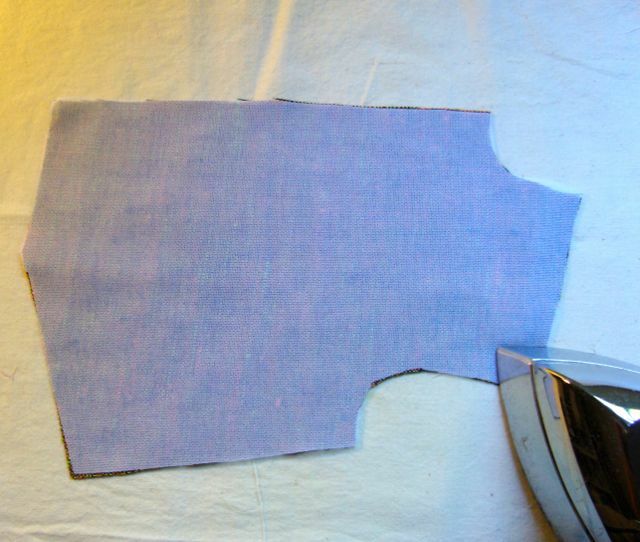 For the front, cut a piece of the silk fabric about 1-1/2 to 2 times as wide and 3 inches longer than the pattern. 3. Center the silk over the fusible and fold in random pleats beginning at the center and working out to the sides, pinning in place. When the arrangement is satisfactory, lightly fuse in place from the right. Press carefully just enough to “baste” the silk to the fusible. Remove the pins. 4. Flip the piece over and fuse properly from the wrong side. 5. Trim away the excess silk surrounding the fusible. 6. Construct according to the pattern. How do you underline your garments? 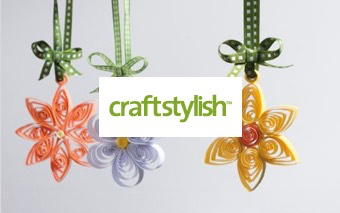 Do you plan on underlining with fusible interfacing? Be sure to share your experiences in the comments section. Be sure you've placed the underlining correctly on the fabric. Test a corner first. 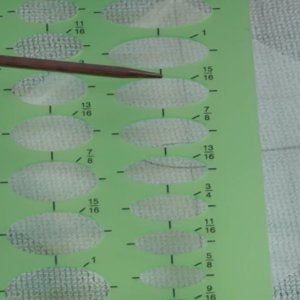 Make small samples of the fusibles to fabric to be sure you're using a suitable product. Thank you very much for this article. I never knew what an underlining was, nor why I would need one. This answered all my questions and the information about the fusible interfacing is a bonus. Thank you, Mary. I love the random-pleated top! 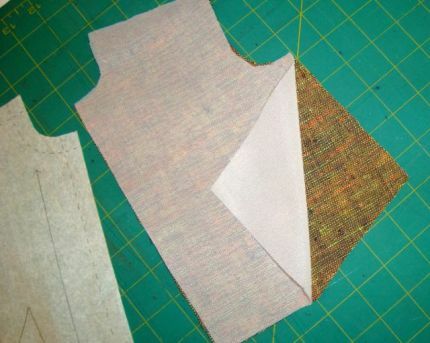 I usually test the underlining on a scrap(at least 4"x4")of my fashion fabric before cutting any pieces from my pattern to be sure the drape is suitable for the project. 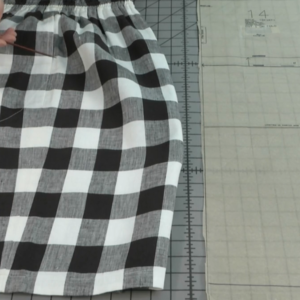 If the pattern has several small pieces, someitmes it is easier to fuse a larger piece of fashion fabric and cut those pieces from it instead of fusing each piece individually. As you show, it is important to use a pressing cloth. I always fuse from the center out because it is easy to distort the pattern pieces. Always lift the iron and "press", do not "iron". What a timely article for me. I have some "stash" fabric that is just too thin to wear without a camisole and I wondered if I could underline it with fusible interfacing and then be able to wear the garment with the fusible interfacing close to the skin. Now I know I can. Thank you for this article and all the articles you author. 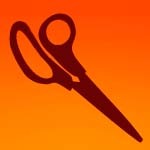 Wouldn't it save a step to fuse the interfacing to the fashion fabric, then cut them out at once? Great article and very helpful to see your treatment of fusible interfacing. Fusibles are so nice to work with that I use them regularly, and when I got rid of my stash (big mistake - another post) fortunately I kept the interfacing. 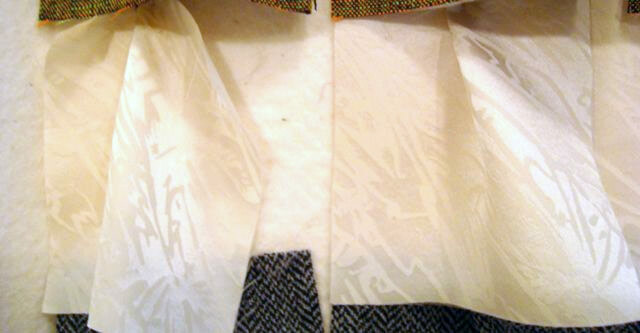 The ways I use fusibles is to add body to tailored clothing, and also in collars, cuffs and tabs on tops. I have special fusible for waist bands that prevents them from rolling and strengthens them. 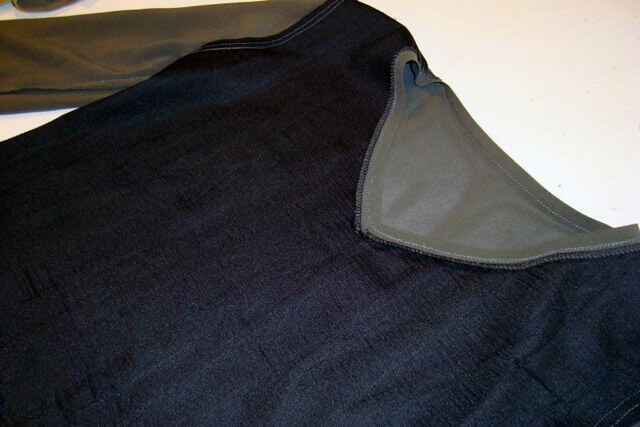 One layer of fusible interfacing for pockets on pants adds sturdiness to an area the receives a lot of use. I especially want to know the name and source of the taupe sample that you have shown. I want to make a jacket that is cut on the bias (Vogue 8910)using a light-weight rayon/linen material. Which interlining would you suggest for such an application? I would very much appreciate your response. Does anyone else have trouble with fusibles bubbling? 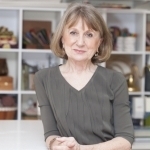 I used to think that my iron was not hot enough or that I hadn't used enough water, or held the heat on long enough. So, I invested in a steam press that gets mighty hot with a burst of steam and I use a damp press cloth and hold for as many seconds at the product indicates (by the clock) and I STILL get bubbling on shirt collars and cuffs; even Fusi-Knit on my wool jacket I was hand tailoring. Am I the Lone Ranger? So frustrating on my husband's custom dress shirts when I've spent so much time and effort and monogramed them. I can't imagine what would happen if I tried to underline an entire garment, like say, a Chanel jacket after all that hand work only to have it bubble. Thanks for a really fine article ! To LaBoheme who has trouble with bubbling...that can be solved by pre-shrinking the fusible interfacing by folding it and dropping it into a sink full of hot water. Let it sit for a while - do not rub or ring it out. Let the water drain away and let it sit and drain some more. Then lift it out and hang it over a shower rod to dry completely. That's solved the problem for me and it's worth the effort as I don't have that bubbling problem any longer. I've done 5 yard pieces this way with no trouble. What I like about fusables is that its very easy to transfer the lines of your pattern to the pieces. I use a white fusable and mark the lines softly with a pencil. 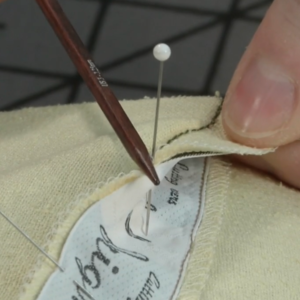 Great tutorial on fusible underlining. What do the fusibles do to the comfort of the fabric? Do linen and wool still breath, or does the cloth and the glue make a 'rubber sheet' of the textile? I was wondering the same thing as Whisper "Wouldn't it save a step to fuse the interfacing to the fashion fabric, then cut them out at once?" & I can see Concordiabelle's point when they stated, "If the pattern has several small pieces, someitmes it is easier to fuse a larger piece of fashion fabric and cut those pieces from it instead of fusing each piece individually." so why wouldn't that apply to larger pieces? 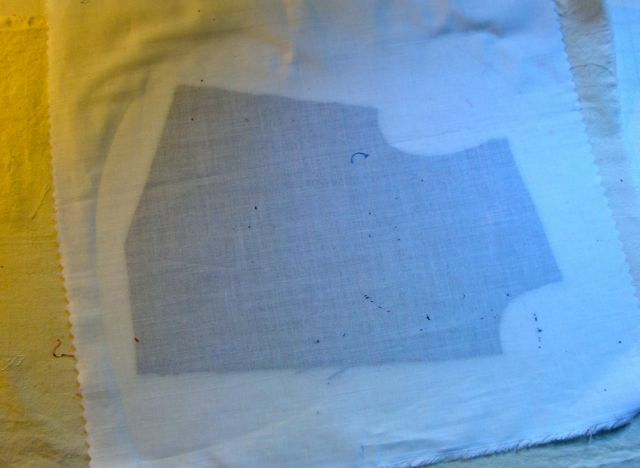 I was also wondering something similar to spjcbjp's comment, "I have some "stash" fabric that is just too thin to wear without a camisole and I wondered if I could underline it with fusible interfacing and then be able to wear the garment with the fusible interfacing close to the skin." but my question is I have ready to wear clothing, can I apply fusible interfacing to it? Your article did help demystify fusibles a lot though and now I know which type do what. Thank you! I have tried fusing the interfacing to the fabric prior to cutting the pattern pieces and handling the two pieces of fabric became unmanageable. 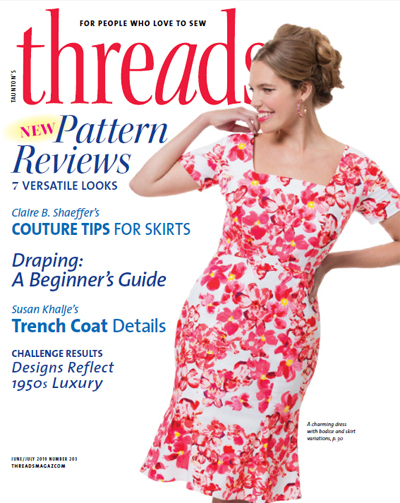 I could not keep the grainlines aligned and inadvertently ironed in a pleat or two. However it worked well with smaller pieces of fabric from which I then cut the smaller pattern pieces, as others have suggested. Why do you consider non-woven interfacing "unsuitable"? First, I think the results are better when you cut fabric and interfacing separately -- at least they are for me -- especially when using fabrics that are less stable. I also think it's easier to fuse in small doses. Preshrinking is necessary with some fusibles -- especially the wovens. However, I have never had a problem with the knits. Sometimes it's a good idea to steam the fusibles in place by letting the iron hover over the fabric with steam first. Then, press in place. The interfacings I sampled are all listed at the end of the aricle. I think any of these would be suitable for the rayon/linen jacket. However, as I've stressed above, always test a sample first. In answer to the question about the suitability of non-wovens: I don't think I would choose any of them as underlining in garments. However, some work well for adding structure to handbags and totes. Thank you for such an informative tutorial. When I fuse large pieces like this I use my Euro Pro Press. I have been very pleased with the fusible interfacngs from Cutting Corners (cuttinglinedesigns.com), Louise Cutting's online shop. At the classes I've taken from her she said that she sources her interfacings from Japan and Europe, and that they are the same products that European designers use. Good article on underlining and nice that some sources of interfacing we're provided. Too bad that the interfacing used in the pleated top is from a retailer that doesn't have a website and presumably doesn't take online orders. If possible can you suggest an alternate source of this type of interfacing ? I'm sure that fusible is available elsewhere, although I don't know of other sources. But, if you call Professional Sewing Supplies they are very accommodating. I would also suggest that the tricot and Pro-Sheer Elegance Light from Fashion Sewing Supply would also be suitable for this project. Really like that randomly pleated top front. I'm going to try that. Thank you. 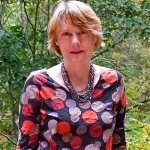 Hi great article! I was taught to fuse the fabric and the underlining uncut together as sometimes if cut in pattern pieces and the fusible applied it can shrink you pieces. Just a note. It would a shame to lose all that fabric.